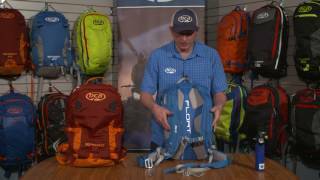 The BCA Float 27L Speed is Backcountry Access’s lightweight full-sized Float pack for all-day touring, featuring the new Float 2.0 system. The Float 27 Speed™ avalanche airbag is designed for close-in backcountry riding and features the new Float 2.0 system. Creating buoyancy and helping you float to the surface, the 150-liter airbag not only decreases your burial depth but also protects your head and neck from trauma in an avalanche. Nearly 30% smaller and 15% lighter than their Float 1.0 engine, the Float 2.0 engine fits inside the Float airbag compartment, freeing up more valuable space in the main compartment. Between their new Float 2.0 engine and new packs, Backcountry Access has shaved 20 percent off the weight of their Float 1.0 system. BCA's newest and lightest avalanche airbag featuring the Float 2.0 Cylinder. Add a BCA Cylinder 2.0 to complete the airbag. Please note that this airbag will not work with previous 1.0 (i.e. up to 2017 cylinders). Includes additional $25 for Dangerous Good Shipping.